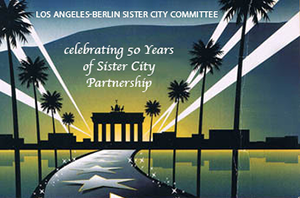 On June 27, 1967 Berlin became Los Angeles' 6th sister city with the mission to foster the friendship between our two prominent cities and to promote cultural, social and commercial exchanges. A myriad of events in the last 50 years have contributed to a deeper understanding and appreciation for the citizens of both cities. In the recent past, we brought Max Raabe and his Palast Orchester to Royce Hall and presented Ute Lemper to the Los Angeles audiences as well as an International Fashion Show "Fashion Made in Berlin" with Berlin Designers..
On October 10, 1990 the Committee dedicated the Berlin Forest in Griffith Park with then Mayor Tom Bradley and the Governing Mayor of Berlin Walter Momper present. The Committee has provided logistical and financial support to exchanges for students and young professionals. We have celebrated the 50 Anniversary of the Berlin Airlift and the 25th of the Fall of the Wall. We are also suppporting and cooperating with many other German-American organizations. Please contact us if you would like to learn more about our organization. We look forward to meeting and seeing you at one of our upcoming events.